Here at the Experience Hendrix Tour (www.experiencehendrixtour.com) we know that your privacy is important to you. The only personal information that we collect is information that you give us when you place an order. We use that information to service your account and to expedite your order(s). In the future, we will also use this information to help personalize your online experience here at experiencehendrixtour.com. Rest assured that you are always in control over your information. We will never share that information with parties interested in emailing you or sending you unsolicited offers. 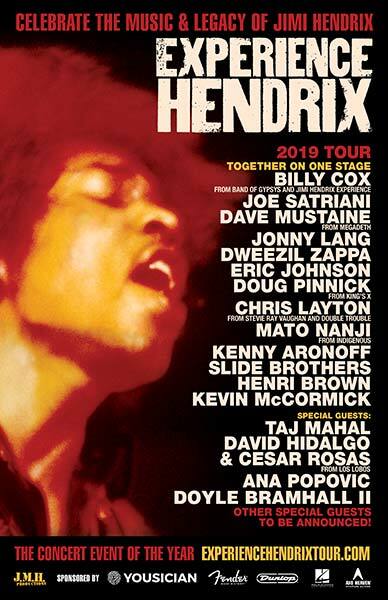 When you place an order through the Experience Hendrix Tour (www.experiencehendrixtour.com), we ask for certain basic information required to make your purchase including your name, your billing and shipping addresses, telephone number, email address, and payment information. If you choose to pay online and with your credit card, this information is also supplied to the credit card company, together with your credit card number, for purposes of processing the transaction. Authentic Hendrix and its affiliates bear no responsibility for the transfer of information by unrelated third parties. This includes but is not limited to your credit card issuer and credit reporting authorities. Because our roots lie in our Mail Order operation at Authentic Hendrix, LLC and its sister company Experience Hendrix, L.L.C., we will occasionally send you new product announcements via postal mail (such as our annual print catalog) or special offers to your email account. You'll always have the option to request that your name be removed from our mailing lists. To do so, please contact our Customer Service Department at . We also keep track of customer purchases, traffic patterns and related site statistics inside our website to help us shape our online progress. Rest assured that the only information we collect from your web browser is solely based on your activities on our network of websites. We do not track your browsing habits as they reflect other sites on the Internet. From time to time, we may randomly contact customers about participating in user surveys about our website(s). Because we do not outsource any of these activities, you will only be contacted by people directly affiliated with Authentic Hendrix, LLC or our sister company Experience Hendrix, L.L.C. These surveys are optional. The responses we gather help us make your online shopping experience even better. Just as we protect your personal information, we also go to great lengths to protect your financial information using state-of-the-art encryption technology to safeguard your online transactions. Our site is protected using the Secure Socket Layer (SSL) of your web browser which is fully supported by both Internet Explorer and Netscape web browsers that are version 3.0 or newer. Your information, including your credit card details, is encrypted and cannot be read as it travels over the internet. Cookies you ask? Yes, cookies, but not the enjoyable baked kind. Cookies as they pertain to the internet are small pieces of information that our servers send through your web browser to your hard drive. A cookie lets our system recognize you and the current purchases you are making. Most web browsers are set to accept cookies automatically, but this setting can be changed in almost all cases. See your web browser's "help section" to learn more about this setting. To help facilitate your online purchases your browser must be set is 'accept' cookies for our site (www.experiencehendrixtour.com). Unlike most online operations, we do not use outside companies to help facilitate our operations. Orders are accepted, processed and fulfilled in our own family run operation. In some instances, namely our Gold Record Awards, these items are shipped directly from the manufacturer. In these cases, your shipping information is provided to these companies, but in no cases will your financial information be shared with third parties unless instructed by federal, state and other legal authorities we believe, in good faith, to have jurisdiction over relevant matters. We will only release your personal information to the proper persons when we believe, in good faith, that we are required to comply with a law or legal process, enforce our agreements, or protect the rights, property or safety of our operations or other persons or entities. We never rent or sell your name and/or email address to other online marketers of products or services without your consent. You have control over how you are contacted from our company. We occasionally send new product announcements via postal mail (such as our annual print catalog) or special offers to your email account. You'll always have the option to request that your name be removed from our mailing lists. To have your information removed from our lists, please contact our Customer Service Department at . Because the Experience Hendrix Tour (www.experiencehendrixtour.com) and it's sister sites (jimihendrix.com, daggerrecords.com, hendrixrecords.com, experiencehendrix.com, et al) are directed to the general public. We do not knowingly collect information from children under 13 years of age. If you believe your child has provided information to our site, please contact our Customer Service Department at . By using the Experience Hendrix Tour (www.experiencehendrixtour.com) and providing us with your personal information, you are accepting the privacy practices described in this document. Experience Hendrix is a Washington State Limited Liability Company and observes generally accepted American practices with respect to the privacy of data collected by it. Experience Hendrix does not represent or warrant that its data collection practices meet the standards of European Union Member States, or any other jurisdiction outside the United States. By your use of this site to order merchandise you agree that you have read and agree to Washington State jurisdiction over any disputes that may arise in connection with it.